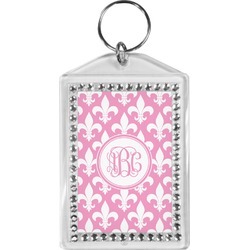 Bling up your keys with our personalized keychains with bejeweled rectangle frames. These are great thoughtful little stocking stuffers or gifts for coworkers, family, and friends. That added touch of personalization really makes them special and the bling gives a glamorous look. 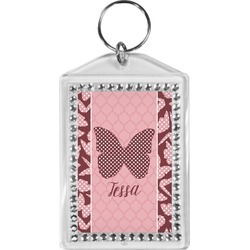 The keychains are durable and have rhinestones around the exterior to accent the design on the inside. 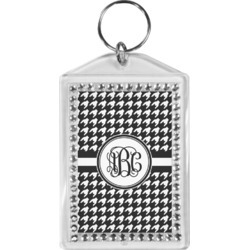 Attach to your keys with the keychain at the top of the rectangle frame and take your glam on the go!! Awesome product and excellent turn around time! My partner has just recently started taking flying lessons so I thought this keychain would be a funny, cute little gift. The keychain is a little larger than what I was expecting. The product listing does note the dimensions & admittedly I did not see what the size of the key chain would actually be. It is on the large side to be used comfortably as a keychain. The frame is quite good but the quality of the personalized print is not so great. The centre section of the keychain shows noticeably faded spots... at a guess I would suggest that possibly a little bit of water got in there, though not sure. Its not especially obvious in a darker/dim room but very obvious under stronger light. All in all, the keychain is "OK" & given the personalization options, my partner did appreciate the gesture. Nice sturdy keychain. I love the colors and it is easy to find in my purse.